The fall of Infrastructure Leasing & Financial Services (IL&FS) has brought to the fore some amusing but bizarre stories that clearly suggests that the rot in the system clearly followed a top-down approach. Despite a drastic fall of the infrastructure conglomerate resulting from unplanned expansion and continuously changing ownership, a group of individuals, especially three from the top deck, not only enjoyed fat pay packages but also ensured hefty raises every year completely ignoring company’s corporate governance and financial accountability. 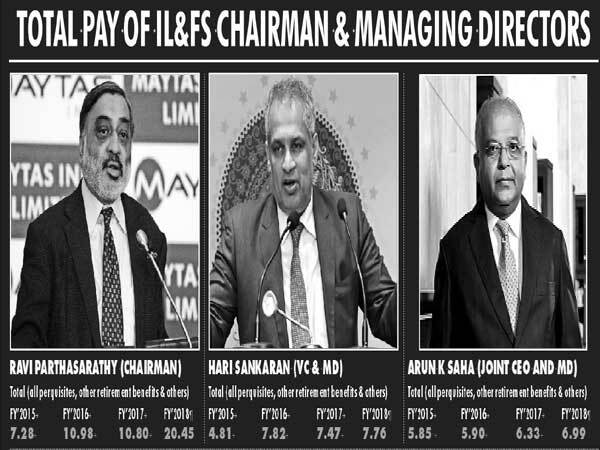 The remuneration of the senior management of IL&FS Ravi Parthasarathy (non-executive chairman from October 4, 2017), Hari Sankaran, vice-chairman and managing director and Arun Saha, joint CEO and managing director, increased significantly since FY15, according to the company’s FY18 annual report. Given such a poor performance by the IL&FS and group entities, senior management paid the price of corporate misgovernance where the company sat with piled-up debt of over Rs 91,000 crore till March 2018. According to the annual report that has also been filed by MCA in NCLT, Parthasarathy’s total emoluments shot up by 144 per cent to Rs 20.45 crore in FY18 from Rs 10.8 crore in FY17. Interestingly, his salary component only rose from Rs 5.80 crore in FY15 to Rs 9.21 crore in FY18, in a period in which the group’s fortunes decisively plummeted. Parthasarathy, a former banker of Citi Bank, joined IL&FS in 1987 as president and CEO, was appointed as managing director in 1989, elevated to vice chairman and managing director in 1994, became chairman and managing director in November 2004. He became a non-executive director and chairman from October 2017 till July 20, 2018, when he finally stepped down for health reasons. Similarly, Hari Sankaran, vice chairman and managing director, has been with the company for 28 years, while Arun K Saha, joint managing director and CEO, joined IL&FS in 1988. Some of the company’s independent directors also have long stints on the board. R C Bhargava, chairman of Maruti Suzuki India, has been on the board since August 1990. Michael Pinto, a former bureaucrat, joined the board in July 2004. Sunil B Mathur, former LIC chairman, joined the board in January 2005 and Jaithirth Rao, formerly from Citibank, was appointed as director in August 2012. The report, however, added that the total annual salary given by the company to all independent directors in FY18 was Rs 2.16 crore where R C Bhargava was paid the maximum pie of Rs 0.57 crore, followed by S B Mathur Rs 0.38 crore, Michael Pinto Rs 0.47 crore, Jaithirth Rao Rs 0.36 crore and Rina Kamath Rs 0.36 crore. As far as the role of independent directors is concerned, it broadly includes improving corporate credibility and governance standards functioning as a watchdog, and playing a vital role in risk management. Independent directors play an active role in various committees set up by company to ensure good governance. Though the company formed a risk management committee (RMC) of the board, which was an extremely important committee in a non-banking finance company, specialising in high-risk infrastructure finance and development, an inherent asset-liability mismatch happened thereafter. The RMC, however, is empowered to review the core functions of the company such as asset liability management, credit, liquidity and market risk, capital adequacy and compliance with regulatory norms.